The Israeli attack on Gaza was in almost every way a war on the poor. Public health, education and housing the Israeli poor depend on will be cut by some 10 billion shekels spent destroying the lives, homes and infrastructure of the Gazans, perhaps the poorest of this country's poor. Over the last thirty years Israel has gone from more or less social democracy to a country with a wealth gap on a third world level. Following in the footsteps of Reagan and Thatcher, Israeli governments stripped public health, education and housing and sold away the country's public assets at discount rates, creating a new class of super rich ('tycoons' or oligarchs) alongside an ever growing population of working poor. Netanyahu, perhaps Israel's most adamant and single minded proponent of neoliberal economics, has accelerated the process in the last decade, first as minister of finance and then as prime minister. According to OECD figures Israel has the second highest poverty rate of all member states (after Mexico) ,The most crowded classrooms and the lowest ratio of public to private expenditure on health. The reality is harsher yet, as the statistics are manipulated to include West Bank settlers but not West Bank Palestinians who have one tenth the per capita income. 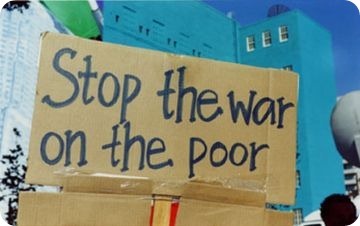 War, here as everywhere, not only deepens poverty but helps distract the poor and channel their anger. In Israel's case a lot of that anger is directed towards other poor. Palestinians within the 1948 lines are only about 20% of Israel's population, but make up close to half of its poor (as defined by the Israeli government). The last war saw a virulent public attack on them including facebook groups calling on Jewish employers to fire Palestinians and a call supported by some cabinet ministers to boycott Palestinian owned businesses. Israel lacks an organized popular left to connect the dots of military expenditure and service cuts, constant war and growing poverty. Its so called Labor Party supported this war as it did all those before it. Its Jewish poor, arguably even more than the rich, largely rallied to support the war and call on the government to deal Palestinians harsher punishment. Ultimately, those who cut hospital beds and build themselves palaces, those that bomb to quell resistance, are failing to see that we are all in this together. That they are part of a society they are helping disintegrate. The cliché about none being safe until all are is doubly true in this country, where we live in such glaring proximity. Yahav Zohar is Senior Tour Guide with Green Olive Tours. - Profile Here.